Can the early macular degeneration patient continue to drive? When should the patient with Retinitis Pigmentosa stop driving? Can a stroke patient return to safe driving? Visual acuity and visual field correlate poorly with crash risk, so how do we make the decision to stop a patient from driving? What are the options to help our mildly impaired patients continue to drive safely? Our Doctors of Optometry at the Low Vision Centers of Indiana have worked extensively in driving rehabilitation. 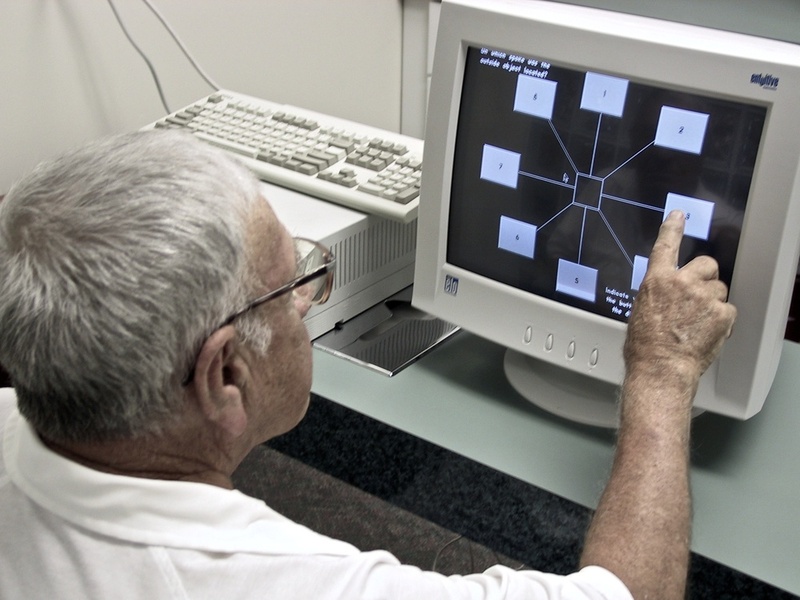 We have developed a number of programs to evaluate patients with both low vision and acquired brain injury. Additionally, our programs interact with outside occupational therapists and rehabilitation driving specialists to provide a comprehensive evaluation and rehabilitation of the visually impaired driver. There are a number of clinical tools that can provide insight on the patient’s ability to drive safely. In addition to the classical assessment of visual acuity, refraction and visual field, the visually impaired driver requires a functional assessment of contrast sensitivity, color vision, photostress, night vision and useful field of view. Issues of light and glare must be addressed in many low vision patients. For example, the macular degeneration patient may leave home with adequate vision to drive safely, but photostress effects may bleach retinal pigments causing a dramatic drop in visual acuity. A simple Photostress Test may predict this in the examination room. The proper use of sun filters, hats and visors may reduce these problems as well. The proper type of filter must be prescribed, and amber filters generally work well for macular degeneration patients. They reduce glare, aid in contrast sensitivity and are not so dark as to impaired vision on a shaded street. Counseling is also crucial. Driving into a low sun in the morning or evening must be avoided, because it will photostress the retinas. Additionally, bright headlights at night may photostress the macular degeneration patient. In many cases, a behind-the-wheel evaluation will either demonstrate safe driving or confirm the need for the patient to discontinue driving. We utilize a number of outside driving rehabilitation specialists to perform behind–the-wheel evaluation. Input from family practitioners, physiatrists, geriatricians, neurologists, occupational therapists, physical therapists, and neuro-psychologists can be crucial and instrumental in the assessment of a patient. The visual requirements to obtain a regular driver’s license without any restrictions in Indiana require 20/40 or better visual acuity in both eyes. Outside rearview mirrors are required for people who have the best corrected visual acuity of 20/40 or better in one eye and 20/50 to blind in the other. Glasses are required if the best corrected visual acuity is 20/50 in both eyes. With one eye best corrected to 20/50 and the other eye 20/70 to blind, the requirement is glasses, outside rearview mirrors, and daylight driving only. If both eyes are best corrected to 20/70, the person will be restricted to daylight driving only, have glasses on when driving, rearview mirrors, and must have proof of normal peripheral visual fields. The BMV’s Medical Advisory Committee may be petitioned by our doctors when a patient’s vision falls just outside the published standards. The BMV may allow a behind-the-wheel test to determine if the patient may continue to drive on a limited basis. The BMV may restrict driving by region or time of day. An annual vision examination and report to the BMV is required. Waivers are usually considered only for patients with vision loss just below the required levels. The patient must have the best-corrected carrier visual acuity of 20/200 or better in one eye. Visual acuity through the bioptic system must be 20/40 or better. The patient must have adequate color vision to see traffic and brake lights. Additionally, a peripheral visual field of 120 degrees total in one or both eyes combined is needed to be a candidate for bioptic licensure. The candidate must have an application for a bioptic driver’s license submitted by his or her low vision specialist following fitting and training with the bioptic. A rehabilitation driving evaluation must be performed by a BMV approved driving rehabilitation specialist. Thirty hours of behind-the-wheel driver’s training is required, followed by an extended driving road test by the BMV. The BMV requires a report of an annual eye examination from a low vision specialist. In selected stable cases, a biannual report may be allowed. The Indiana BMV will consider issuing a night-time bioptic license for selected individuals. Those patients with conditions that are not adversely affected at lower light levels, such as albinism, may be candidates for night driving. The key is to individually evaluate each patient to determine the patient’s ability to drive safely. We must understand that visual acuity and visual field have correlated poorly in driving safety while new technologies, like UFOV, have shown a good ability to predict crash risk. We must act quickly and decisively to discontinue driving when a patient lacks the ability to continue safe driving, but likewise we must offer patients who qualify, appropriate rehabilitation and limited licensing options that safely meet their needs. A cadre of professionals, such as low vision specialists and driving rehabilitation specialists, can help many patients continue to drive or to return to driving safely.